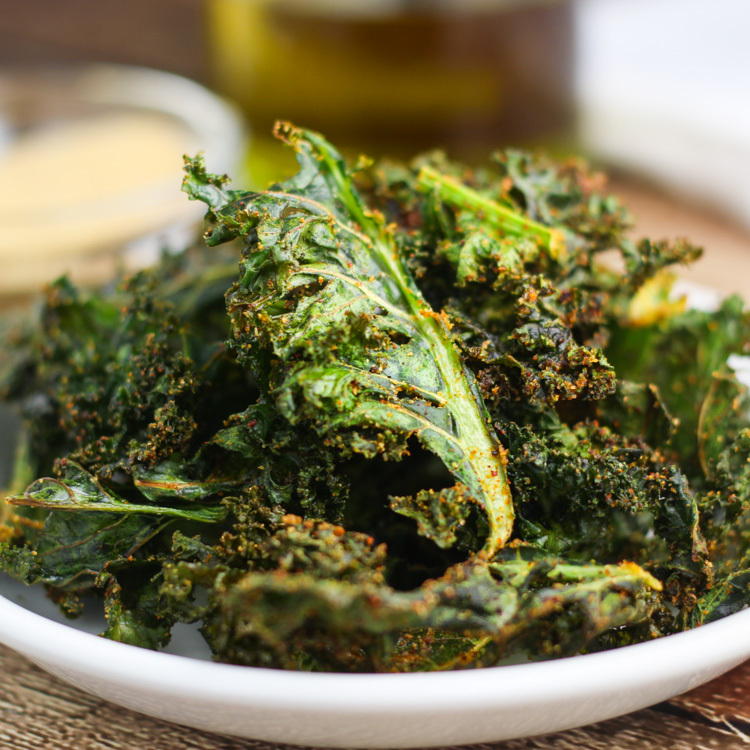 Cheesy Kale Chips Seasoned with Nutritional Yeast, Garlic, Onion, Chili Powder and Salt are Baked to make a Delicious and Crispy Snack. Kale Chips – Ah yes, another kale chip recipe to add to the blogosphere… Do we really need another? To tell you the truth, I was debating with myself whether to post this or not. BUT, these are just SO DARN GOOD, I had to share! This may change your movie watching snacking game as we know it – Light and crispy chips (made of kale!) that taste faintly of nacho cheese doritos – Um, yeah, NACHO CHEESE DORITOS with zero guilt. As I’ve mentioned before, I’m a big fan of making healthier versions of dishes, just so that I can eat A LOT. Make a batch of these, and they’ll last you about halfway through Almost Famous or one episode of Real Housewives. The kale leaves are removed from the stems and rinsed and dried. Be sure that you get them REALLY dry – A salad spinner can help with this, or just press them really well between two dishtowels. Once dry, these babies are massaged with oil and sprinkled with our magical spice blend. Said “magic spice blend” consists of nutritional yeast, chili powder, garlic powder, onion powder, paprika and salt. The nutritional yeast is what gives these “chips” their cheesy flavor. It comes in two forms, flakes or powder. For this recipe, I prefer the powder, because it clings to the kale leaves better. However, the flakes will work as well if that is all that you can find. These bake up so light and crispy and are great straight out of the oven. Unfortunately, I have not had much luck with storing the chips and enjoying later – They tend to lose their crispness after sitting a while. One benefit to that is it limits you to enjoying these at home. Why is this a benefit? I have to tell you these are best enjoyed with familiar company or by yourself because they tend to stick in your teeth. Can you trust your co-worker to tell you if you have a big green hob in your teeth? Studies show that only 66% of humans would tell a co-worker if they had food stuck in their teeth. What?! Boo! There’s your fun fact for the day! We’re in my college hometown of Eugene this weekend. Our friend Michelle had a surprise 40th birthday party on Friday night which was a great time! 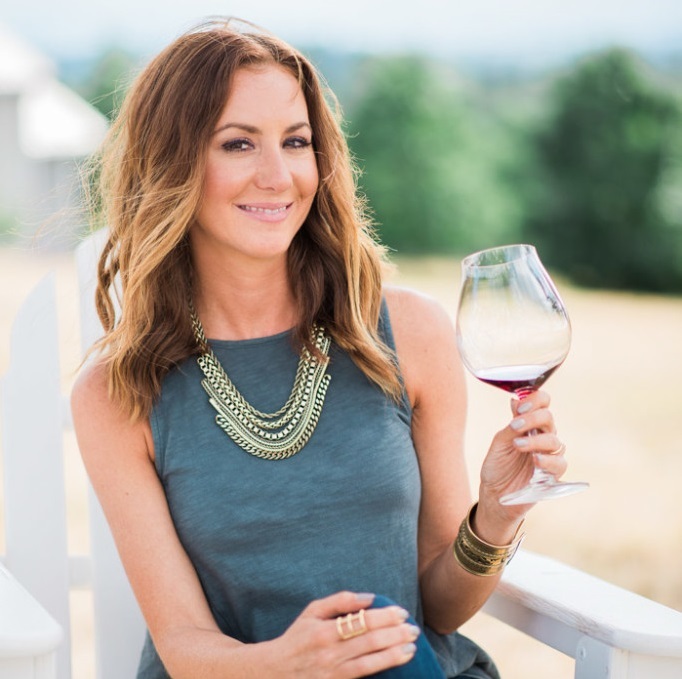 Today, I’m headed to King Estate Winery for a late-birthday celebration for my friend Julia. I miss being so close to this great vineyard – Such a beautiful setting, great wines (Pinot Noir and Pinot Gris are their specialty), and an amazing restaurant on site. If you are ever in the Willamette Valley, I highly suggest visiting this one! I hope you all have a spectacular weekend! If we all put our minds together, do you think we can make Monday disappear? Preheat oven to 300 degrees (if you have a convection oven, use that setting). Line a large rimmed baking sheet with a Silpat or parchment paper. Remove the leaves from the stems of kale and tear into large pieces, discarding the stems. Wash and dry thoroughly. Place the leaves in a bowl and sprinkle the oil on top. Using your hands, massage the oil into the leaves, ensuring that they are evenly coated. Combine all spices in a small bowl and sprinkle over kale leaves. Toss well to combine. Spread the leaves out in a single layer on your baking sheet and place in the oven. Bake for 20-25 minutes, rotating the pan halfway through if not using convection, until evenly crispy. Let cool slightly and enjoy. PS - These are best when enjoyed immediately as they will lose their crispness over time. um yeah, you had me at Doritos. I actually think there can never be enough kale chip recipes. so thank you – I make them often enough that I will be trying your version soon! Thanks Dini! Those lamb sliders with mango that you recently posted look so yummy as well! Yum!!!!! These look awesome! I have these ingredients at home so I am definitely trying it! Thanks Cheyanne – I just checked out your blog and all of your recipes look AMAZING! Yum! Yay! I think you’ll love them Hadia! I never heard of nutritional yeast is that something you can get at the grocery store or is it something just available online? Hi Cindy: Many times you can find the nutritional yeast in the bulk section of your grocery store, especially if it carries natural products. Otherwise – You may need to search online. It is available on Amazon here. Would you recommend your seasoning mix on anything else? Hi Amy – It’s also great on popcorn or french fries! Enjoy!